The Lenovo Tab 4 8 Plus is an 8-inch Android tablet running Nougat. It comes with decent internal hardware, a nice design, and features like a fingerprint reader. Basically, it is the little brother of the Tab 4 10 Plus. Just smaller. Let‘s take a look at it. First, the Lenovo Tab 4 8 Plus is not available worldwide yet. You can get it in most European countries like Germany, Britain, and Poland. But it is not out in the US yet. It should be soon though. To give you a rough idea about the price: In Europe, you can get the cheapest version with 3GB of RAM and 16GB storage starting at 259 US Dollars. In my experience, it will be a bit cheaper in the US and Asia. I‘m guessing you‘ll have to pay around 229 to 249 US Dollars. The Lenovo Tab 4 8 Plus comes with a glass back, similar to the Samsung Galaxy Tab S3. That certainly looks nice. But, obviously, it‘s attracting fingerprints as well. I would recommend a lighter color like white so you won‘t see them. Around the glass back and the front is a silver bezel that‘s plastic. I would have preferred a metal body. But the design still looks nice, especially considering the price. Above the 8-inch display sits a 5-megapixel front camera. Underneath the screen is a fingerprint reader. With that one, you can unlock the tablet easily. It does not double as a home button though. The typical Android buttons are on the touchscreen only. On the sides are a USB C port and a microSD card slot. You can attach USB accessories to the USB C port if you like. For example, you can connect a mouse, keyboard or external hard drive. There‘s also a 3.5-millimeter audio jack. While there‘s a lot of glass on the back, there‘s also room for an 8-megapixel camera. As mentioned earlier, the Lenovo Tab 4 8 Plus has an 8-inch screen. It‘s an IPS panel with an aspect ratio of 16:10. Unlike the standard Tab 4 8, it does have a full HD resolution at 1920 x 1200. Considering the size of the display that‘s a relatively high pixel density. Underneath the display runs a Qualcomm Snapdragon 625 octa-core processor. Those eight cores are clocked at 2.0GHz. You can get the tablet with 3GB or 4GB of RAM. You can choose to get it with a 16GB or 64GB internal storage. No choices in between though. It supports WiFi, Bluetooth 4.2 and you can get it with LTE 4G as well. As you might expect in 2017, on the Lenovo Tab 4 8 Plus runs Android 7.1.1 Nougat. So it‘s a pretty recent version of the Google operating system. Luckily, Lenovo didn‘t customize the UI a lot. Instead, it‘s pretty much standard Android. There are a couple of special features though. For example, there‘s a kids mode with a kid’s friendly interface. Lenovo also implemented a productivity mode. Once you activate it, Android looks a bit more like a desktop operating system. It‘s much easier to use it with a mouse and keyboard this way. While I didn’t review the tablet yet, I did check it out at Mobile World Congress. Here is my hands on video with my first impressions. Also, the review results are probably very similar to my review of the Lenovo Tab 4 10 Plus. They’re basically identical but with different sized displays. 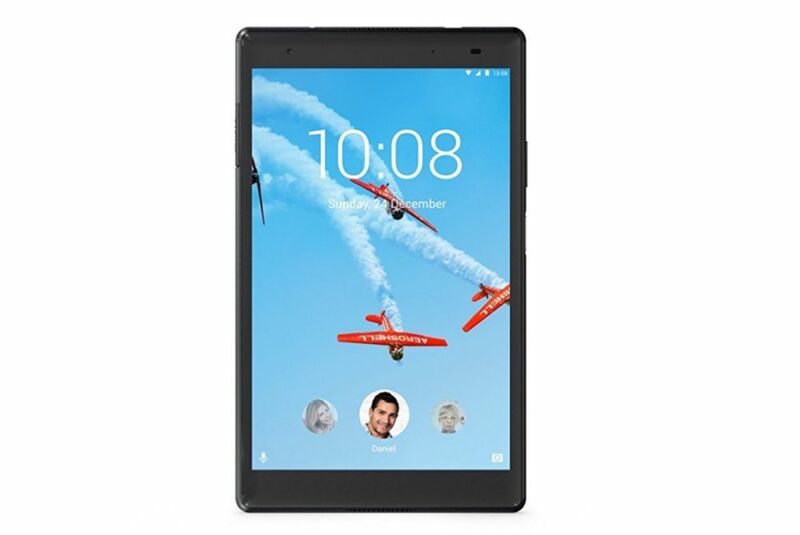 The Lenovo Tab 4 8 Plus is an 8-inch Android tablet with a Qualcomm Snapdragon 625, a full HD resolution and premium features like a fingerprint reader. It's hardware is powerful but energy efficient.